Apparently, making cel-ray soda is hard. Here’s the thing. Like any self respecting Jew from the east coast, I love the peculiar taste of Dr. Brown’s Cel-Ray soda. You either totally get that statement, or you’re thinking…”What?! Celery flavored soda?! Nasty.” I know. It’s ok. Sad thing is, Dr. Brown’s sodas are now made mostly of crap. High Fructose Corn Syrup. Preservatives. Artificial. No good. So I thought I’d do it myself. Why not? I did cure my own bacon. I combined soda water, celery juice, ground celery seed, and simple syrup in various ratios. 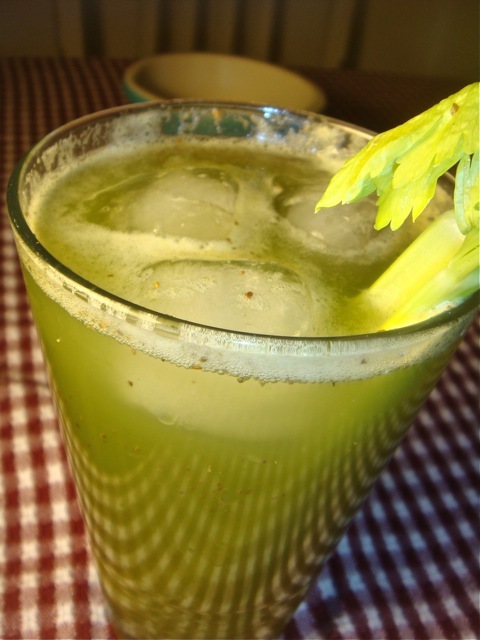 3 soda to 1.5 simple syrup to 1 celery juice, plus a good pinch of celery seed was pretty good. But it never quite worked. Maybe I need more artificial flavors. It’s a good thing I don’t drink a lot of soda. Let’s say you’ve recently caramelized a lot of onions. Let’s also say that you have some killer Hearst Ranch flank steak ready to be grilled. And a roasted red pepper. Top that with a box of free rolls from Nature’s Pride, via my friends at Foodbuzz. What’s a dude to do? The answer is obvious. They should write a paragraph filled with links. 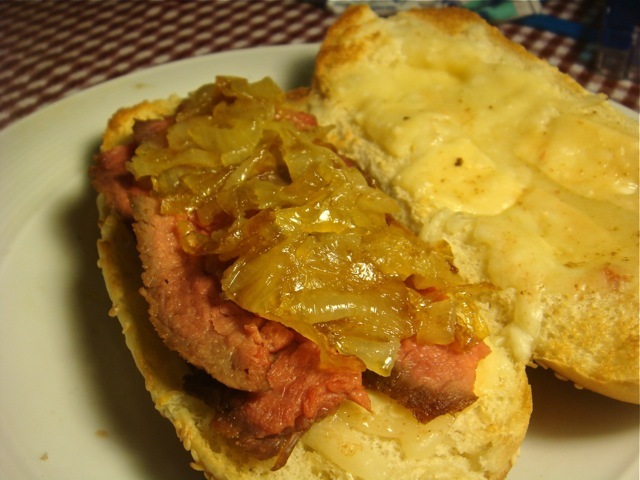 And, said dude should also make an awesome steak sammy. Rub both sides of a Flank Steak with a flavorful spice rub. Grill steak over very hot coals for about 5 minutes per side. Let steak cool, and then make very thin slices at a 45 degree angle. *I made one sandwich with Nature Pride’s Country White Deli Roll and another with their Whole Wheat Bakery Bun. Spread a little bit of Dijon Mustard and Ketchup on the toasted cheesy roll. 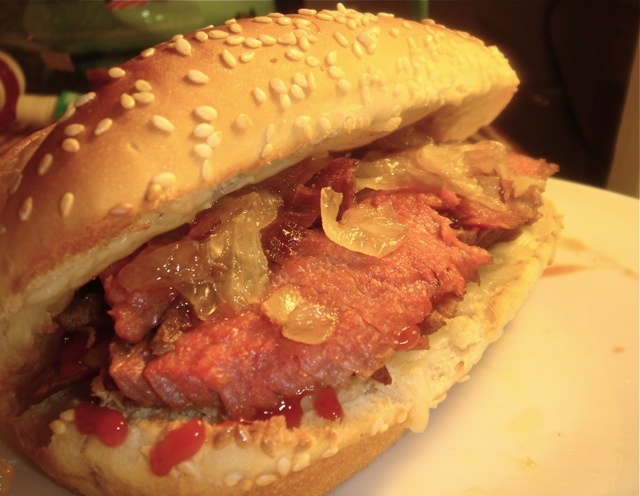 Layer like this: Sliced Flank Steak, Caramelized Onions, Roasted Red Peppers, Flank Steak. If you’re feeling special, you might want to add a little bit of arugula and parsley. It’s nice. *A special note about Nature’s Pride bread, since they were nice enough to send me samples (and we all know how I LOVE free things). If you don’t have a local bread maker that you love, they really are a great alternative. Sure, they’re owned by the same company that makes Wonder Bread. Get over it. It’s nice to see such a large company respond to what’s good for people, leave the cheap stuff and preservatives behind, and make a product they can be proud of. A properly caramelized onion is a beautiful thing. The onion’s pungent, sulfurous flavor is transformed into something mellow, sweet, and layered. They’re killer condiment: layer them into a sandwich, toss them in a salad, stir them into soup or sauce. 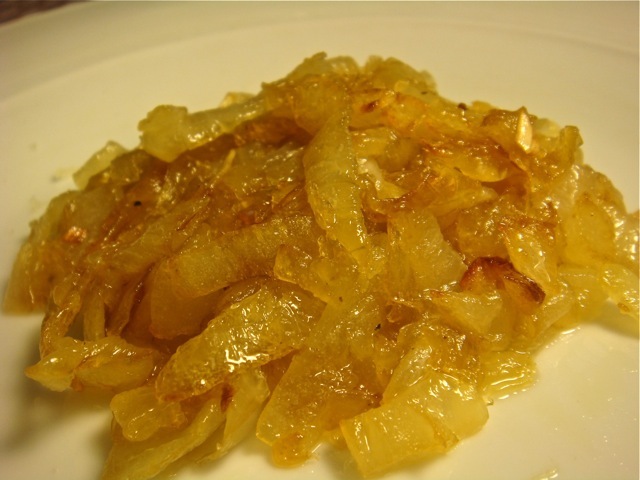 Caramelized onions keep well in the refrigerator, and freeze beautifully. So make a bunch. The biggest challenge of making caramelized onions is having enough patience. Seriously. It’s a tough one. This can take up to an hour, so be prepared. It’s totally worth it. Heat a large pan to just below medium. Allow fats to heat up, and then stir in onions and a pinch or two of salt. Cover pan, and let cook for 5 minutes. Let onions cook until softened and colored anywhere from golden to mahogany, depending on desired depth of flavor. And how much patience you have. Stir occasionally, but not too often. I know, that sounds a bit vague and tricky. You need to allow the onion enough time to have contact with the heat of the pan in order for the onions to caramelize, but you don’t want to leave it so long that they will burn. As a general estimate, I’d recommend stirring about every 5 minutes. But you’re going to have to watch and use your judgment. Have confidence, you can do it. So there you go. Put on some fantastic music, gather your patience, and make some amazing caramelized onions. People love Trader Joe’s frozen products. I do, too. 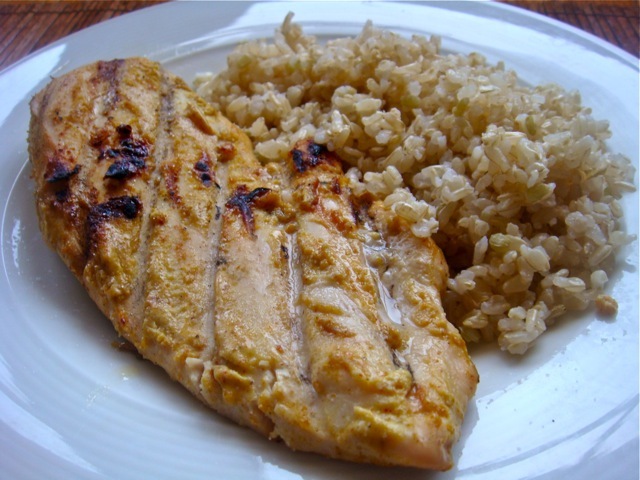 The frozen brown rice is the jammy jam jam, and they make a convenient marinated chicken breast. Since I’ve had no luck finding a frozen pizza I enjoy, I figured I’d give Trader Joe’s a shot. I went with the Trader Giotto’s Pizza Margherita, because, as every pizza lover knows, the true test of a great pizza is to try it in it’s most basic form. Thin, but not paper thin. Chewy, with a bit of firmness. Outer crust crunch & fresh tasting- almost like a great bread stick. Simple ingredient list. I understood everything, and it all belonged in a pizza. No preservatives or chemicals. Nice balance between sauce and cheese. Real cheese. The frozen “fresh” mozzarella had a lovely subtle cream and salt flavor. Cooks quickly. 8.5 minutes (the package says 7, but that’s a lie…) in a preheated oven. The price is right: $3.99 for a pizza that easily serves 2. It made my apartment smell very nice. Does it really need to be made in Italy? We can’t do this in the U.S.A.? Sauce is pretty good, but could use a bit more flavor, especially garlic. I’d like some parmesan cheese, too. Just a little more salty goodness. It’s another win for Trader Joe’s. I think I want to become BFFs with the people who make the frozen food there. Three for three in frozen food tests so far. 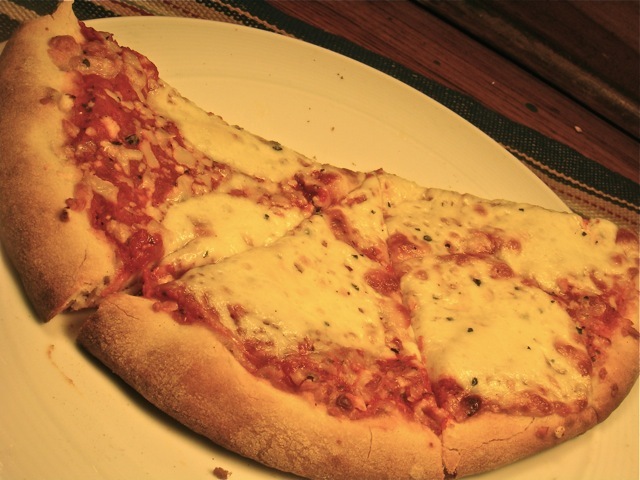 This pizza is better than most fresh pizzas (amazing NY pizza joints excluded, of course). Would I have it again? You bet. But I would add a little bit of this and a little bit of that to make it just a tiny bit better. I’ve been making so many super-involved dishes like home cured bacon recently, I thought it was time to post something a bit less complex. And by a bit, I mean totally. This is one of the easiest side dishes you’ll ever make. You’ll make it often, because it’s fantastic. 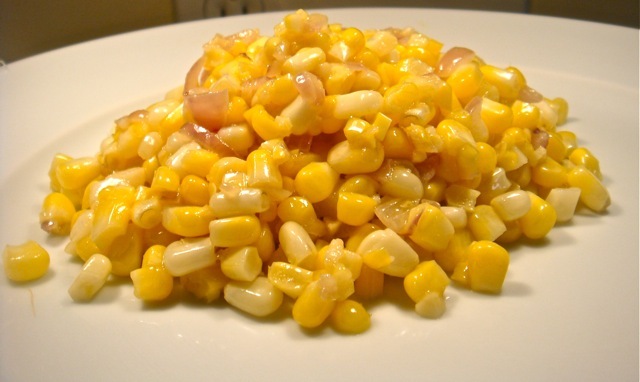 Frozen corn is perfectly fine to use for this. Most of the year, it’s actually a better choice. Wait until hot hot summertime for ears of corn. 10 minutes, start to finish.